After last years trip to Knoydart we had to wait another year for our latest hiking trip to Scotland. As always we had booked flights and cars already in January and since then kept our fingers crossed for good weather. But to our dismay the forecast in the week before the trip was not looking good at all. As this years playground we chose the Kintail family (with brothers and sisters) and some of the Munros between Mullardoch and Glen Affric. To cut a long story short we flew from Berlin to Glasgow, collected our cars (one ugly looking Nissan Juke), bought all the required food & whisky, had some burgers in the Dumbarton McD and drove north. Our next stop was Fort Bill where we were looking for camping gas cartridges. What we did not consider was, that we would arrive after 6pm, so most shops would have already closed. Fortunately the Mountain Warehouse was still open and even more fortunately the had cartridges. Without these the tour would have been considerably spoiled. No coffee, no noodles, no porridge, no tea, no soup. 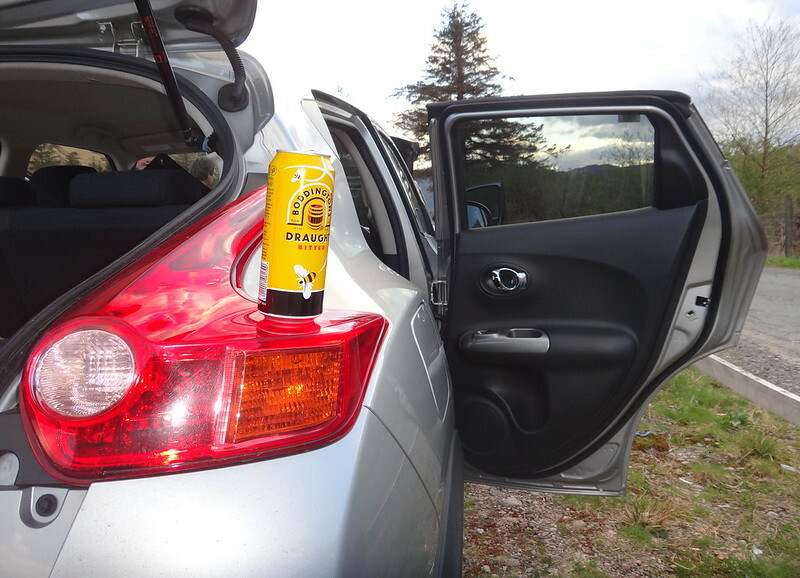 Realising how late it already was we left Fort Bill in a hurry and flew along the roads to the Morvich campground where we left the cars, crammed all the food into our rucksacks and started our little walk but not before we had a last beer. And thus we found out why the Nissan Juke has such odd looking tail lights. They have a purpose! 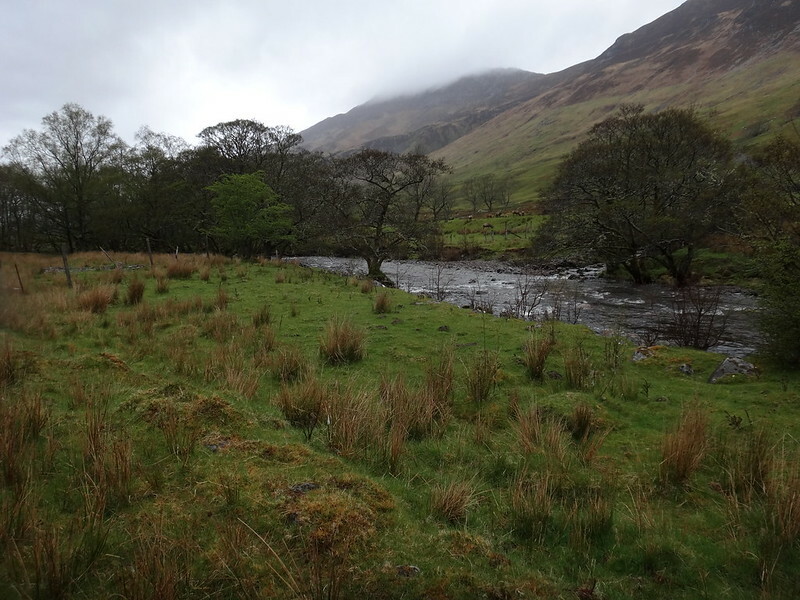 Close to the Allt a Chruinn hamlet we ascended along the corresponding burn and found a wet but relatively even site to place our tents near the 400m contour line. 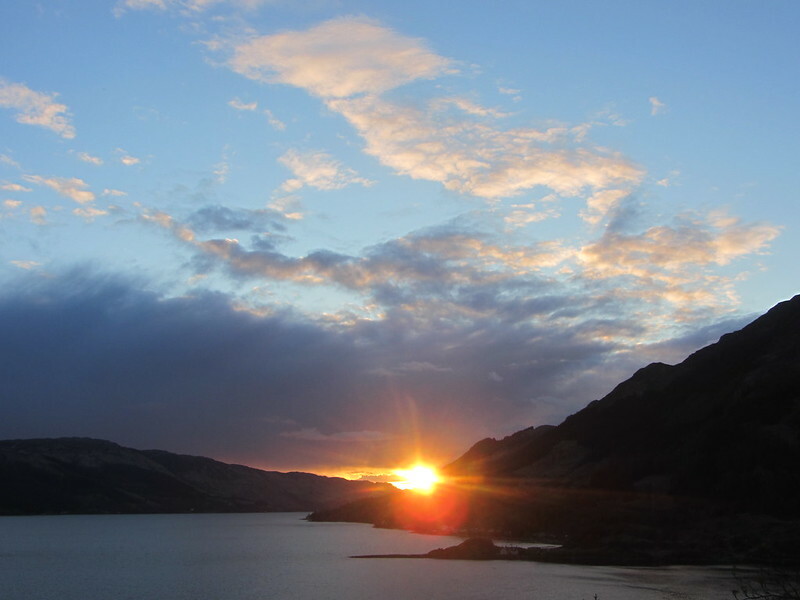 The sunset over Loch Duich was so vivid and intense as if the sky was on fire. Not long after the first stars could be seen and after putting up the tents we went quickly into our sleeping bags. When we woke up the were only a few fluffy clouds in the sky and i had the feeling that its going to be a great day. 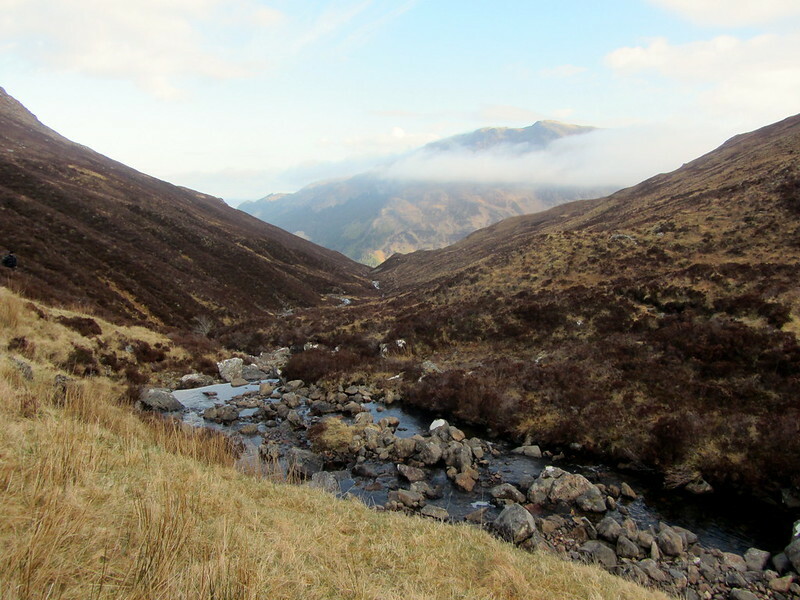 We set off along the Allt a Chruinn burn until we reached the bealach between Beinn Bhuidhe and Sgurr na Moraich and had a wonderful view over Gleann Lichd where the waters of River Croe glistened in the sun. 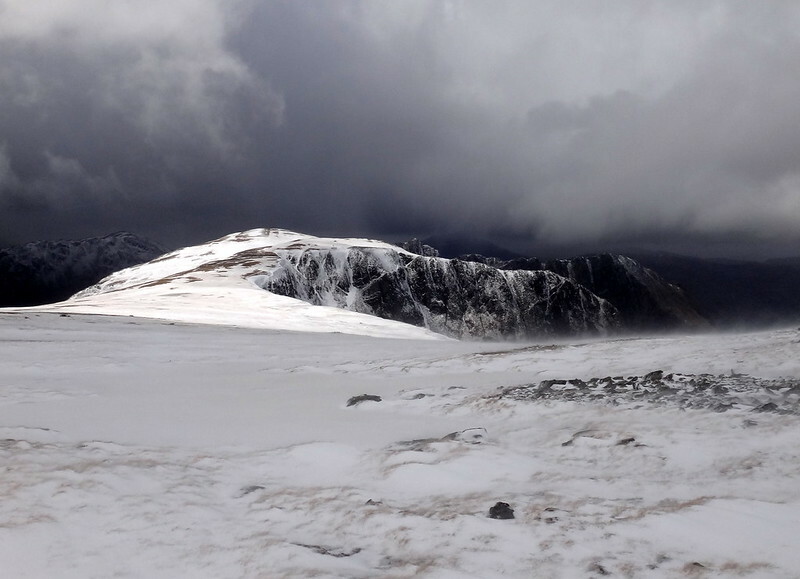 By the time we tackled Beinn Bhuidhe the sun had disappeared and a cold wind blew. On Sgurr nan Saighead, our first Munro this year, we met a very nice man from Marple near Manchester who was walking from the west to the east coast (230 miles) in 14 days. Incredible! We saw him during the day a couple of times ahead of us, but he was faster and did not spend too much time enjoying the views. 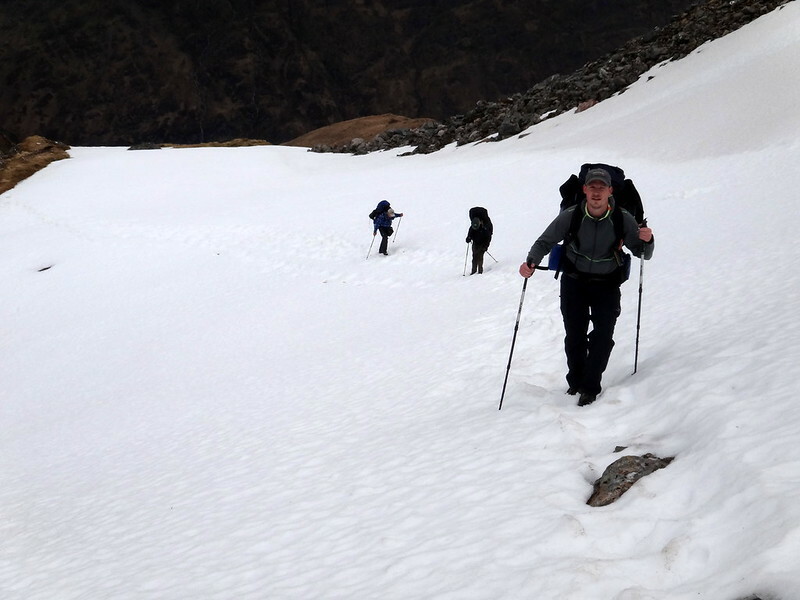 On the ascend to Sgurr Fhuaran we had to cross a huge snow field which was quite impressive. 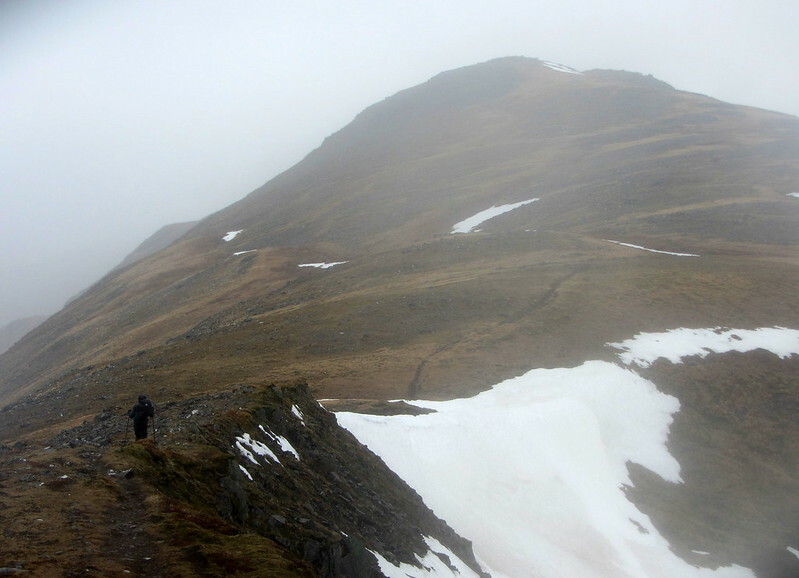 Above 900m there were still patches of snow, making the path sometimes invisible and always very slippery. Not long after we reached our first Munro of the day and of the tour. Each of us had a mouthful of the Famous Grouse, but we did not spend much time on the top because the weather had deteriorated and a strong wind blew. In the bealach we had a short break for lunch, boiling some water and enjoying tasty chicken&lemon grass soup. 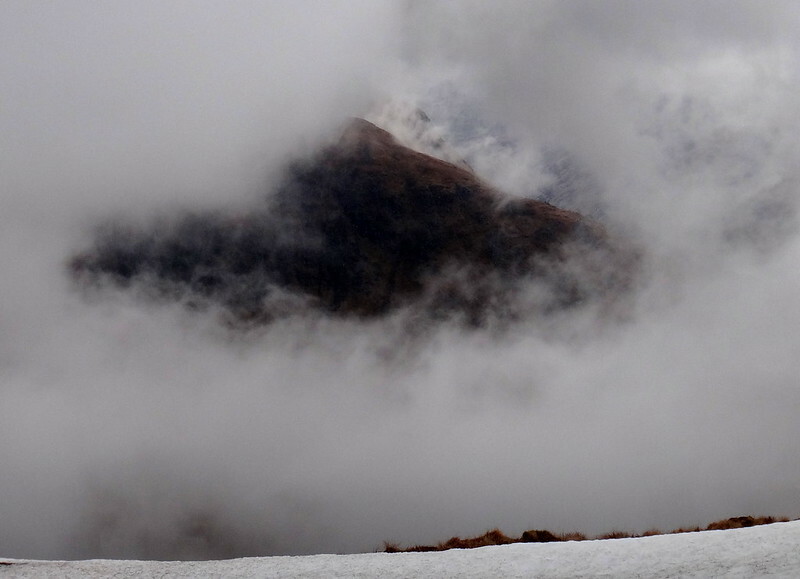 As for enjoying the views: On the next Sister and 2nd Munro of the day Sgurr na Carnach the cloud ceiling had finally dropped below 1000m and there was just a white void around us. By that time our group 7 had begun to stretch a bit and the fastest had to wait for some time until the last arrived at the top. A dream of a ridge walk! Not long after on Sgurr na ciste Dubhe (peak the black chest) rain had set in and the waiting time became longer and longer so that one of us had to turn back to search for the missing mate. In fact the last one was indeed not feeling very well possibly because of exhaustion in combination with a cold. So we decided not to push to hard and find a place very we could pitch our tents. The problem here: Such a place is hard to find on a mountain ridge and so we had to plod along the ridge over Sgurr nan Spainteach all the way to the Bealach An Lapain. Here our walkie-talkies became handy because the two fastest were already descending into the corrie whereas the rest of us waited at the saddle. Finally the had found a wet (did I mentioned that it was still raining) but reasonably even spot in the corrie at a place named An Lapan in the OS map. Exhausted and cold as we were we pitched the tents in no time and went straight into our sleeping bags and slept for a few hours (it was around five by then) before the hunger woke us again and so we had spaghetti and after that settled for the night. Day 2, And now: The Brothers! After a night with constant rain we woke in the morning to ...right, more rain. So we waited for an hour until there was a pause. In the next precious, rainless minutes we had a quick coffee, enjoyed our porridge and packed our belongings and as soon as we were finished the rain started again. 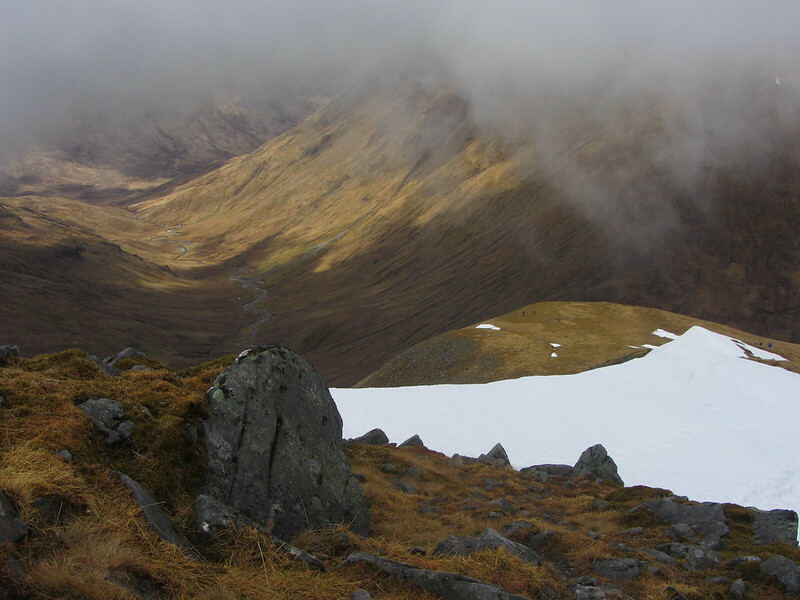 The scramble back to the ridge was easy and an hour later we had reached Saileag, the first Brother Munro. As the day before there were no views, just mist, rain and cold. My gloves were completely soaked by then so that I had to put plastic bags over them in order to keep the cold wind away. 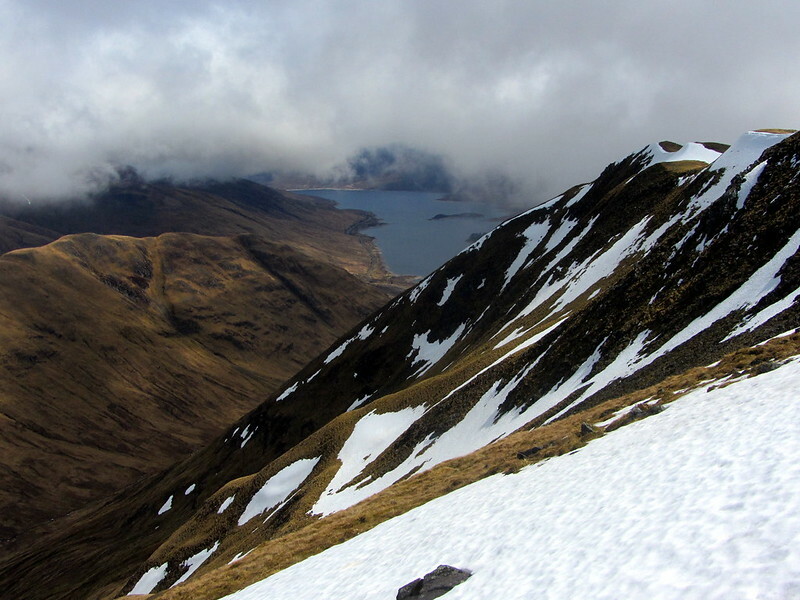 I do not remember a lot of the way along the ridge over Sgurr a Bhealaich Dheirg to Aonach Meadhoin. It wasn’t particularly far or strenuous but the constant wind and mist let my mind wander. On the descend from last of the Brothers Aonach Meadhoin we finally left the cloud ceiling behind and had some wonderful views down to Loch Cluanie and into the valleys around Ciste Dubh. At the Bealach a Choinich our group separated. 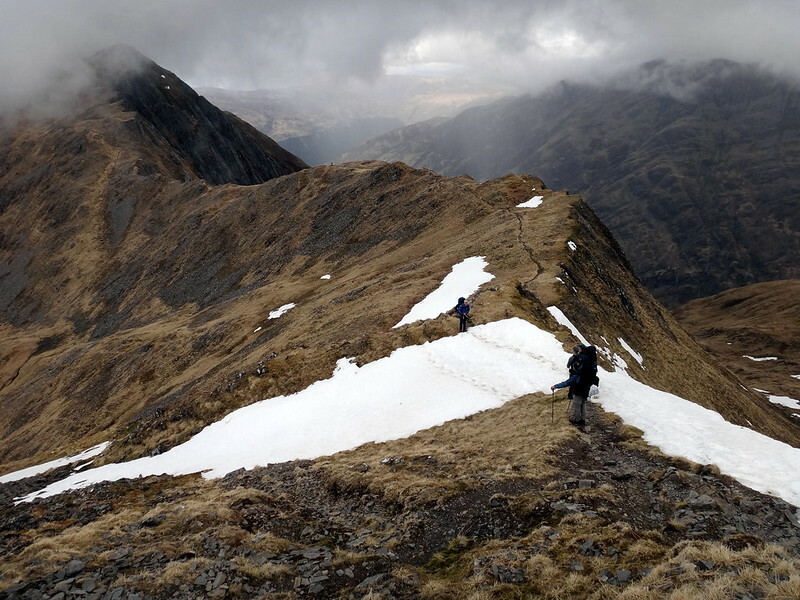 One of our mates had serious trouble with his knee and wasn’t too keen on tackling the Munro Ciste Dubh which loomed before us. 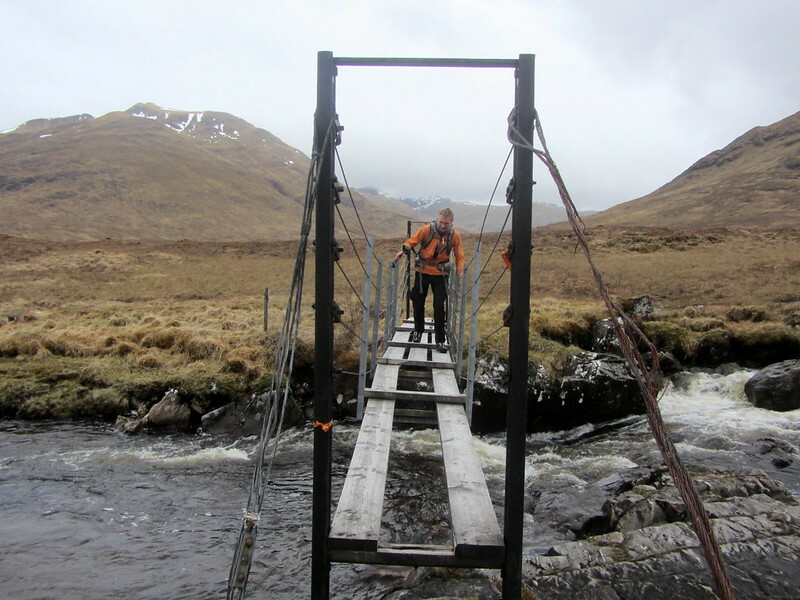 A few of the others also wished to pass Ciste Dubh on the west side in the Allt Cam-ban valley. We agreed to meet in the vicinity of the Alltbeithe youth hostel and pitch our tents there. So it was just three of us climbing up the steep side of Ciste Dubh and soon we reached the clouds again and the view was lost. On the way up I was wondering why the path was so well defined and quite wide in places whereas on the Sister and Brothers ridge the path was sometimes not as obvious. Well the answer came when we reached the top of Ciste Dubh: The path is a dead end. 90% of the walkers turn around and descend on the same path. 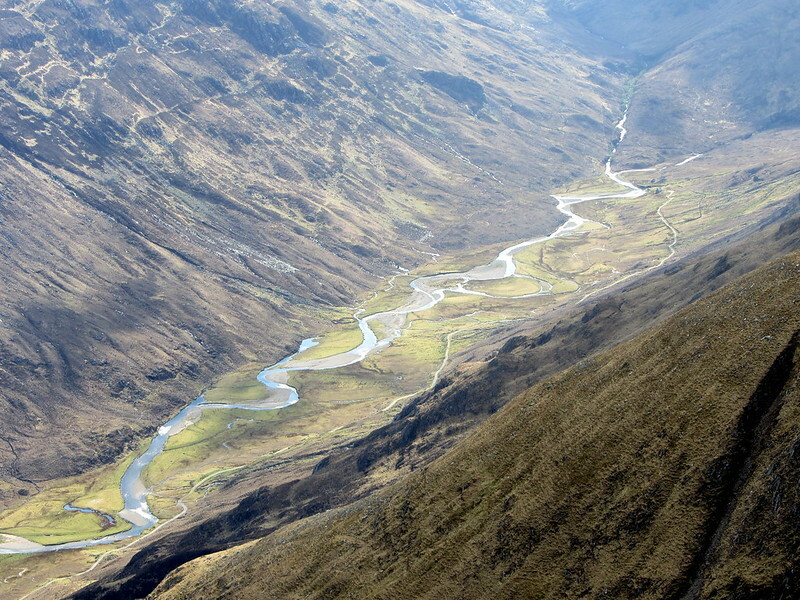 Bad for us because we wanted to continue straight to Alltbeithe which lies at the northeastern base of Ciste Dubh. The lack of a suitable path didn’t stop us and so we descended via the steep corrie Coire na h-Eidich. I honestly had my doubts whether this was such a good idea but my mates convinced me to take the short way instead of turning back. My doubt were not without reason and in the lower part of the corrie, where its is much steeper I slipped, landed on my back and slid around 10m before coming to a stop. That happened 3 more times although without the sliding part. I was glad that I still had my waterproofs on so that I washed away the dirt once we reached the river Allt Cam-ban. Finding a place where we could wade through the river wasn’t easy because the water levels were high due to all the rain. But at least the sun peered through the clouds and for a while the rain-soaked heather and grad glistened in the sun. Beautiful. 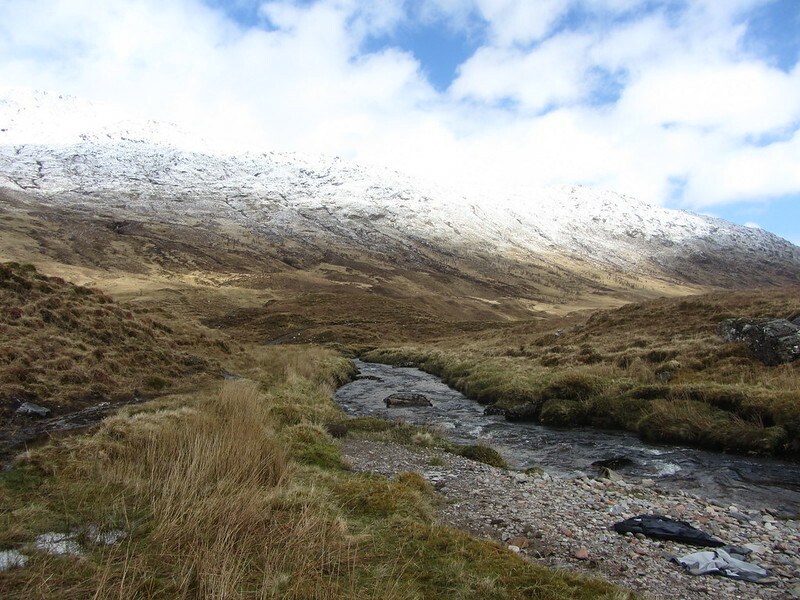 Once we were on the northern side of the of the river just below the old Camban bothy I tried to radio our friends via the walkie-talkie which indeed did work. 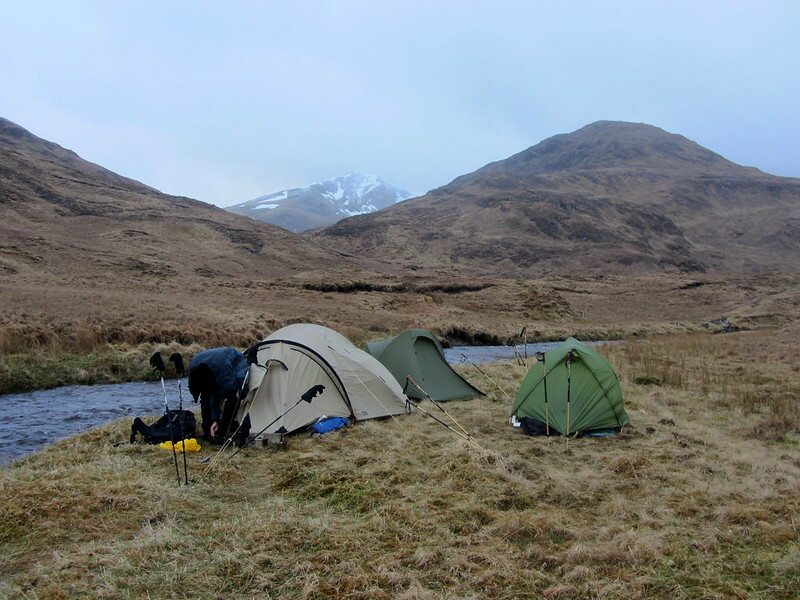 They told us they had pitched the tents around 500m upstream from the Alltbeithe youth hostel just as agreed. Fine, we thought, thats just a 3km walk along the path. My mate wondered, if by any chance our friends had mistaken the Camban bothy with the youth hostel, but I was sure they hadn’t. So in high spirits and in anticipation of a warm tea at the camp we set off. 45 mins later we were a mere 100m from the youth hostel but there was no sign of the tents anywhere. Arghhh, our friends were not here and we reckoned they must have mistaken the bothy for the youth hostel! My mate was right all along. I tried to radio our missing mates but they were out of range. 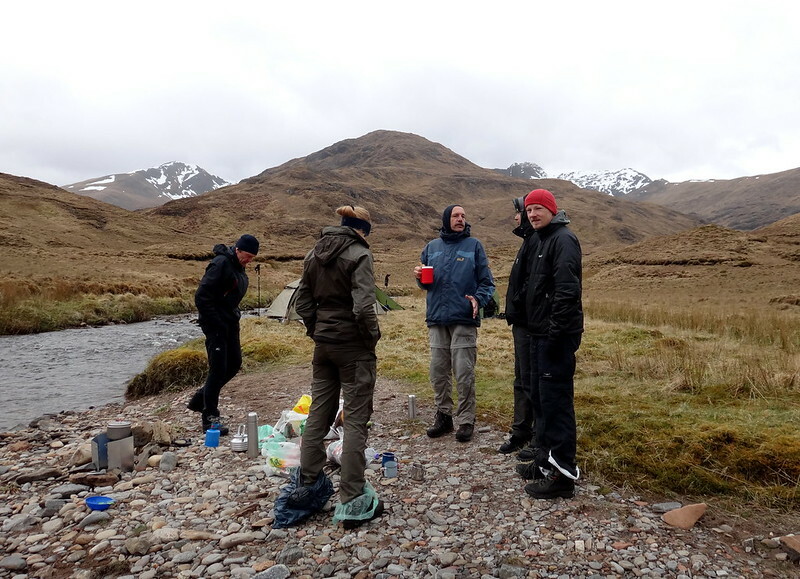 So we walked back to the Camban bothy and along the way we were able to establish a radio connection and thus we found out that they had camped 1km upstream of the Camban bothy. But luck wasn’t on their side either because their group had no gas cartdrige and so they couldn’t prepare tea or soup. But in the end we were all laughing and enjoyed the evening at our campsite along the river while having spaghetti and ketchup. Yes, we have wrapped our feet in plastic bags Shoes were completely soaked! 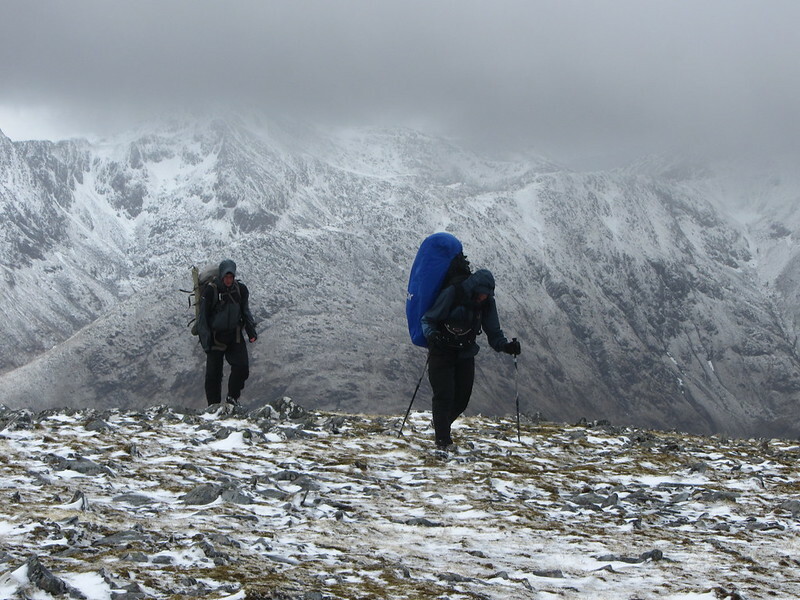 This day was a bit different because we decided to leave our tents in place and go for a walk with light rucksacks. 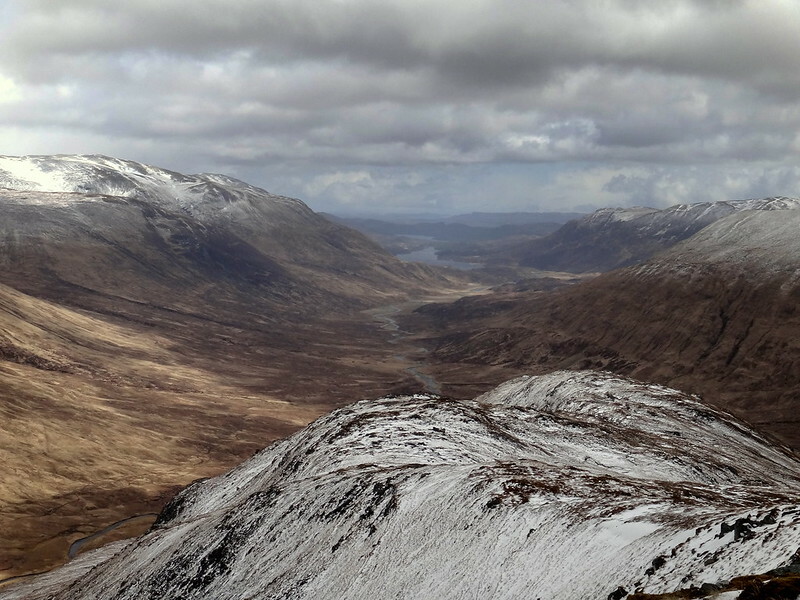 But our friends knee was still no better so he couldn’t really tackle any Munros today. In the end just my mate and me went for long round towards the north of Alltbeithe whereas the remainder decided to stay in the glen and walk to Loch a Bhealaich. 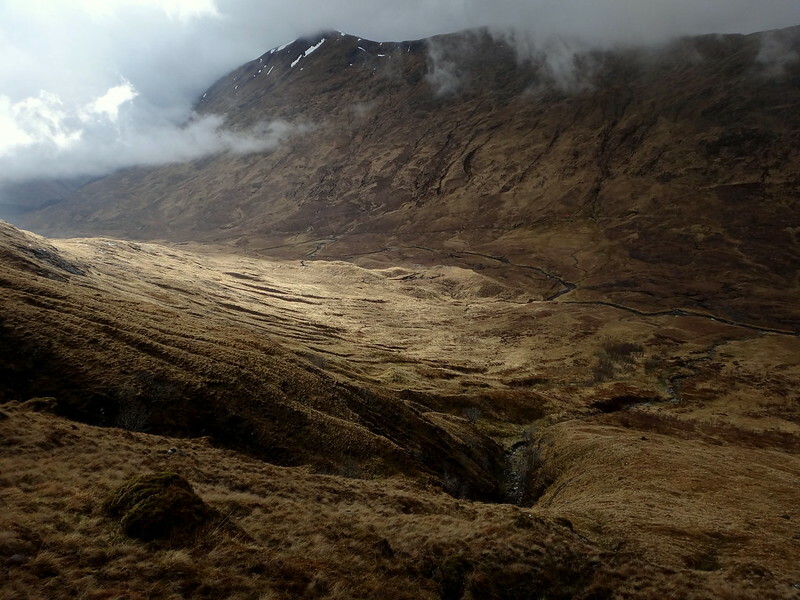 Initially the idea was to start at the Alltbeithe hostel, climb up to Sgurr nan Ceathreamhnan follow the ridge to the northeast and climb Mullach na Dheiragain turn east and drop into the Glen Choilich abd scramble up Bheinn Fionnlaidh. Here we wanted to follow the ridge along Carn Eige and Mam Sodhail all the way to An Socach where we would have turned south back to the hostel. 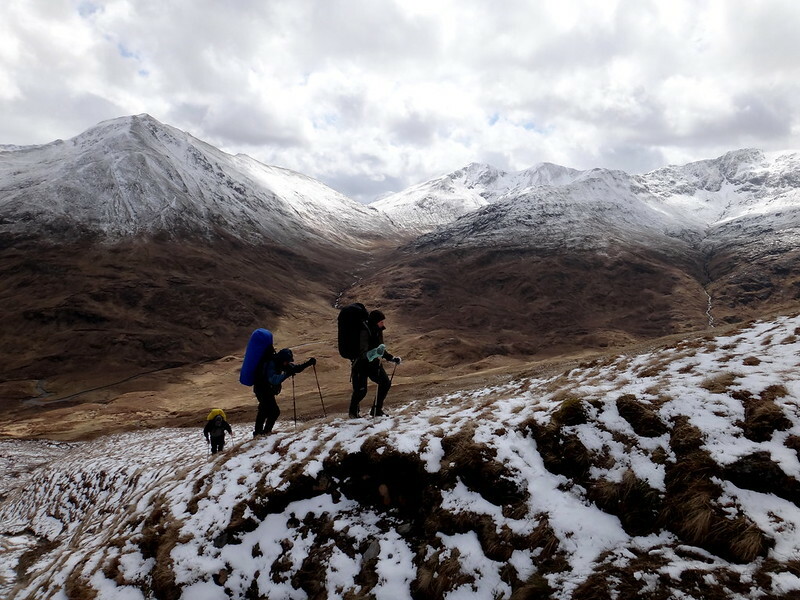 With this idea in mind we started at around 10.15 and followed the path back to the hostel but turned northwest and walked up the steep side of Beinn a t-Socaich. After the steep initial climb the ascend becomes more gentle and soon after we reached the top of the hill and continued along the ridge to the Munro with the unpronounceable name: Sgurr nan Ceathreamhnan. Well, we reached the West Top but because the cloud ceiling was at 900m the Main Top was nowhere to be seen. And so we discovered a serious disadvantage of GPS units over a good old compass. We had to walk into a random direction to see on the GPS unit which direction it was and whether to bear left or right. No wonder we did initially walk into a southeasterly direction whereas norteasterly would have been right. When we realised our mistake we had to climb up a steep rock face which was covered with snow. In retrospect I must admit it was stupid to climb instead of turning back and retracing our steps. 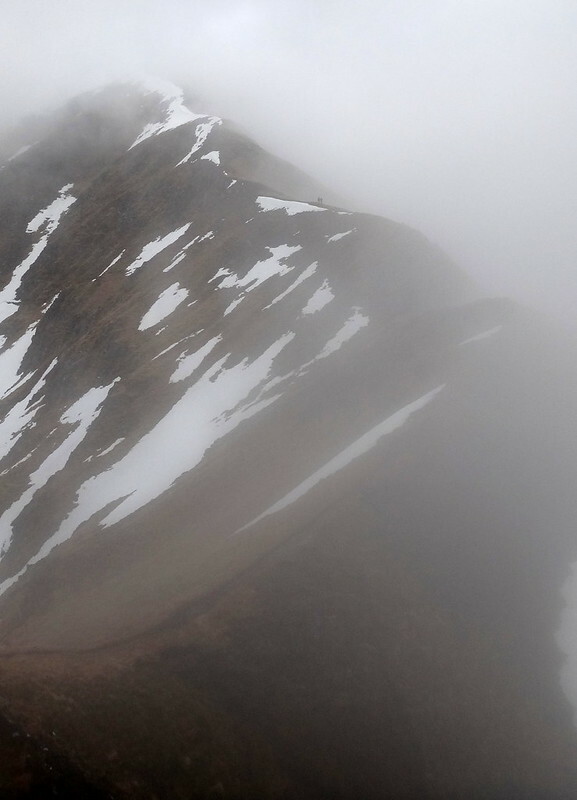 But well, nothing bad happened and with shaky legs we found the spine that connect the West Top with the Munro. 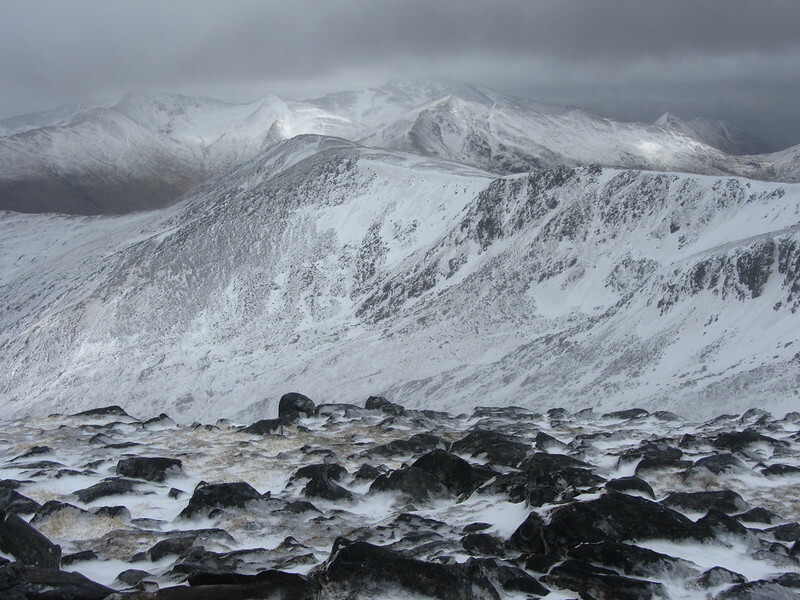 Because of the wind and the snow we did not celebrate our first Munro of the day but continued along the spine to Carn na Con Dhu. This was easy to find because someone had taken that path before us and we could see his steps in the snow. At the saddle between Sgurr Say-My-Name and Carn na Con Dhu we took a short break and had some fruit bars and water. By that time it was already after noon and we came to the conclusion that the full round we had planned earlier, was not achievable. 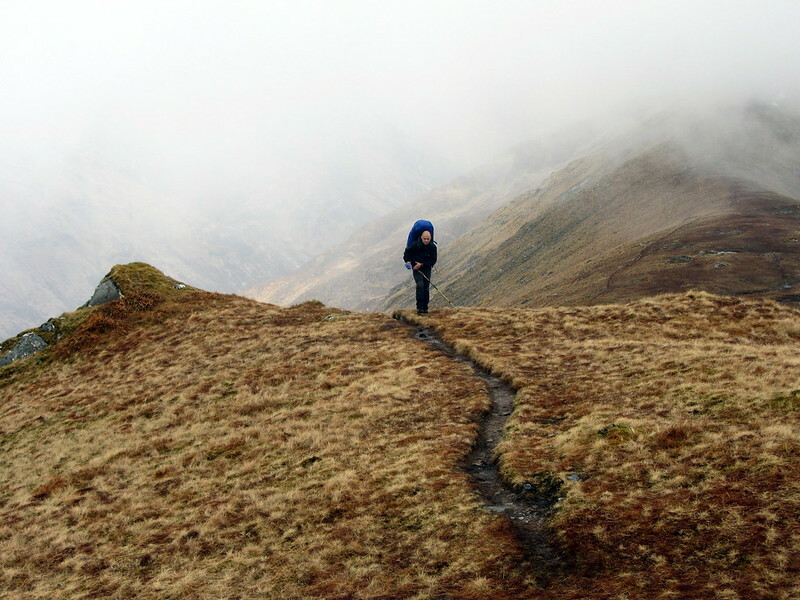 Nevertheless we continued along the path in constant rain and mist with cold hands and wet faces until an hour later we stood on the second Munro of Mullach na Dheiragain. As usual no view but wind and …. more rain. 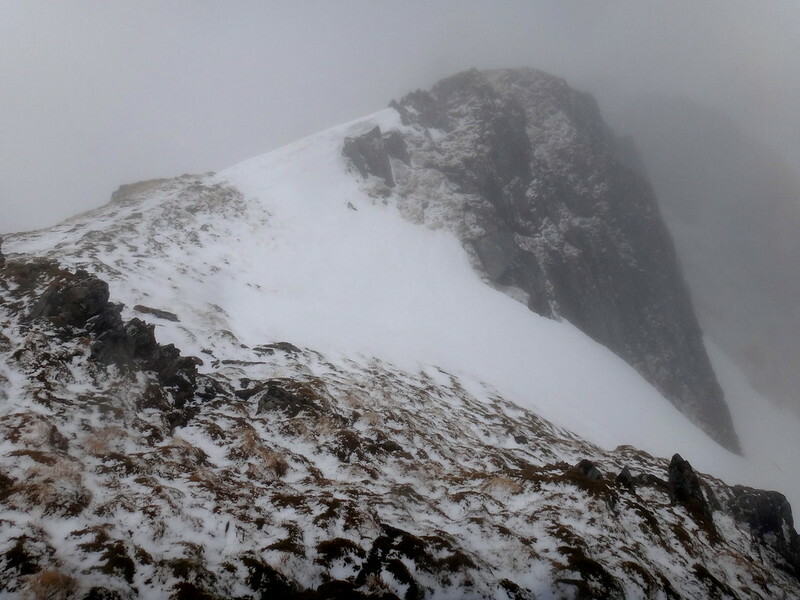 We retraced our steps back to the saddle and walked on the eastern slope of Carn na Con Dhu to avoid the top and headed then further east to the little lake Loch Coire nan Dearcag while always trying to maintain our height at 700m. 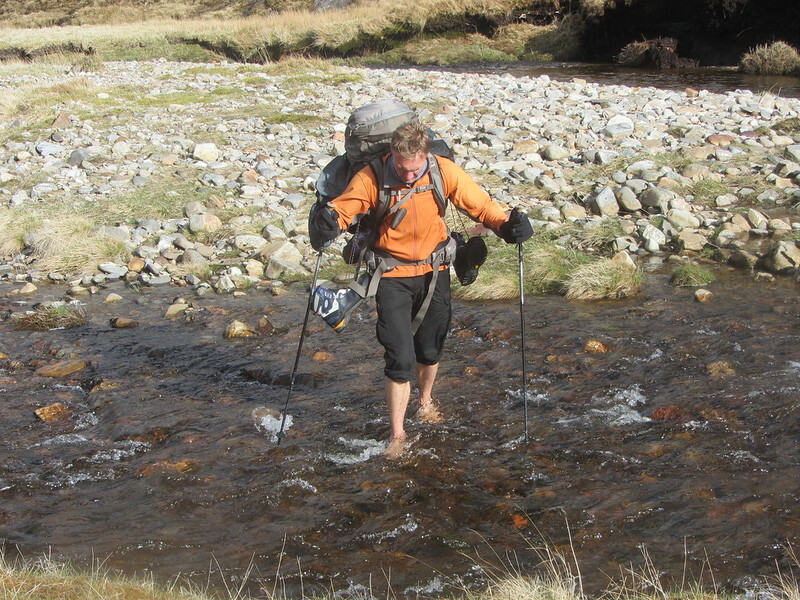 This wasn’t always easy going because of the many streams we had to cross and the slippery moss. 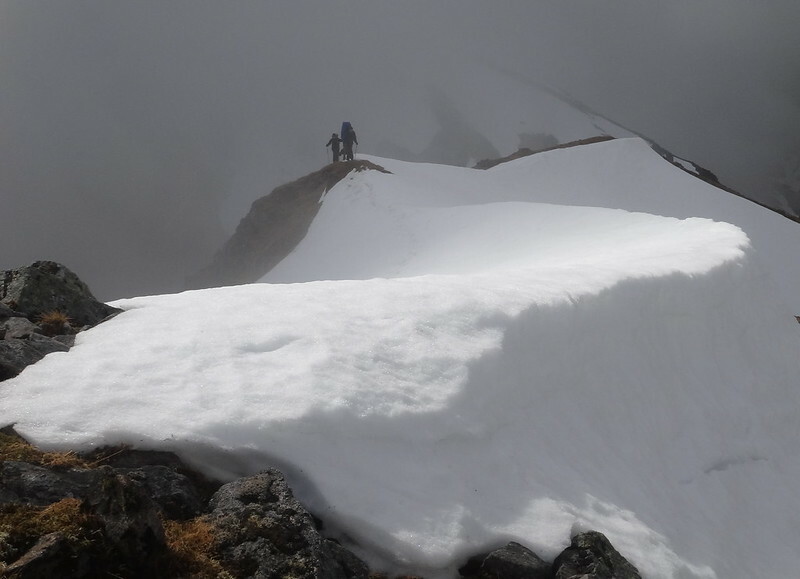 I was a bit concerned about how we could get up on the ridge south of the lake as there were snow fields everywhere but in the end the snow helped us to climb up. Going on the snow was far easier than climbing up the rocks and ledges. Dammit, forgot my ski at home! 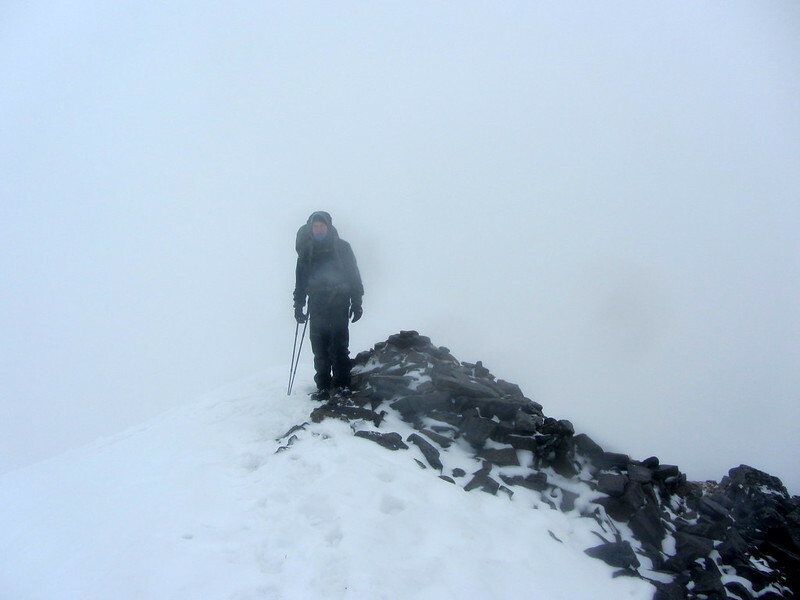 I have to mention that we did not bring neither crampons nor ice axes as we were prepared for a nice cosy spring walk but not for a winter expedition. By then it was late afternoon and my legs expressed a wish to rest and sit down. But then there was this third Munro which we knew was somewhere in the vicinity. 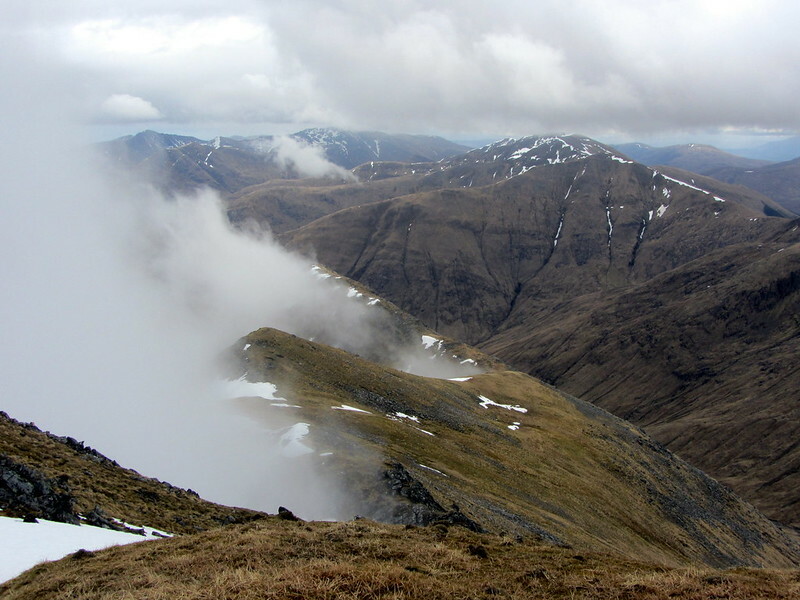 You may be aware that there is no indication in the map whether a top is a Munro or not. Same is true for the GPS. 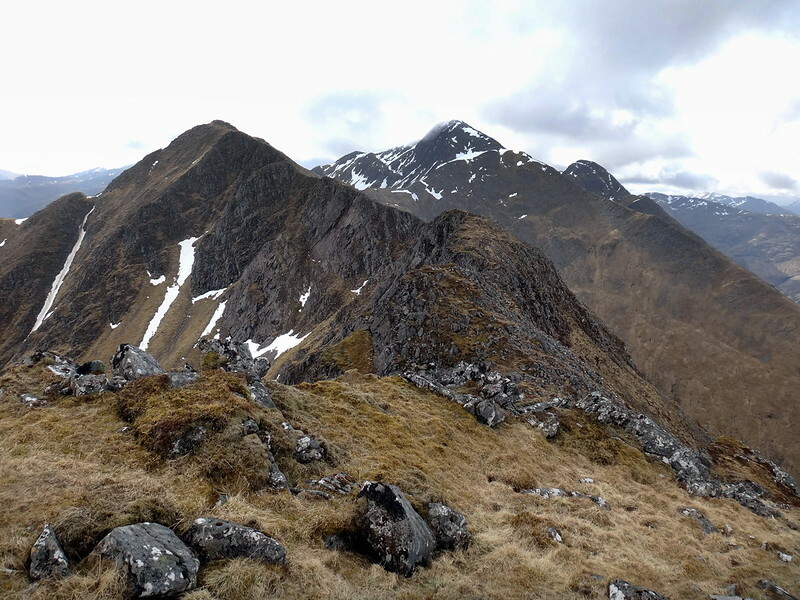 So we stood on the ridge but which of these peak is the Munro? 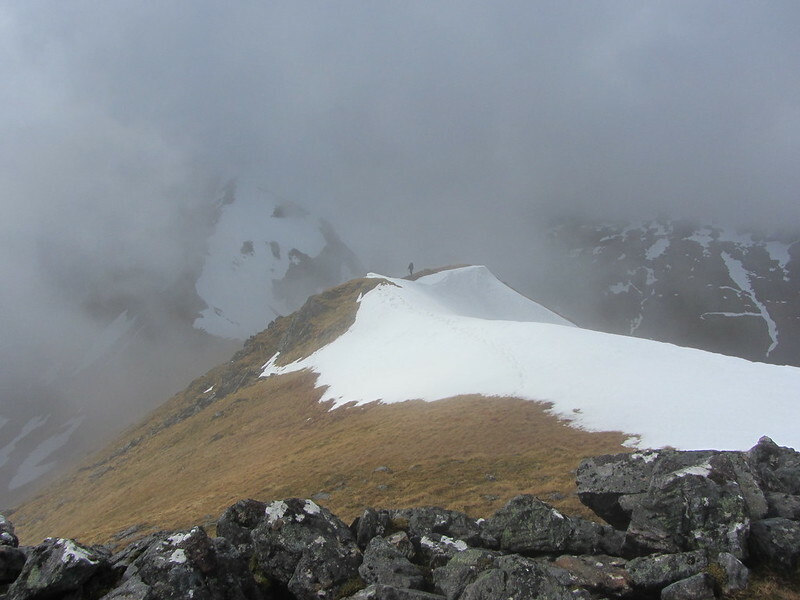 My secret hope was the the nearest top (which was the 941m top west of Stob Coire) is also the Munro so that we can descend quickly after having bagged the one. 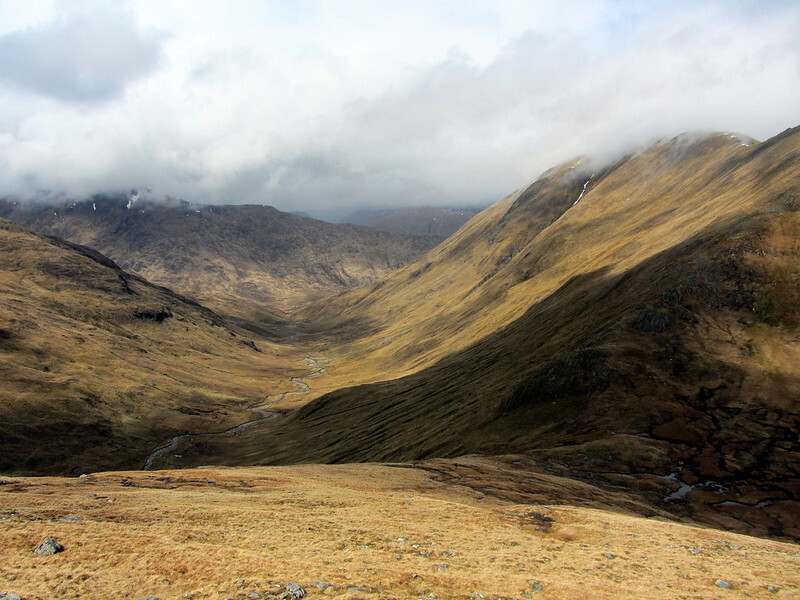 But well, a look into our Munro list and we knew An Socach was the Munro in question and it was still 2km away. Although my legs were begging for the descent we walked on. 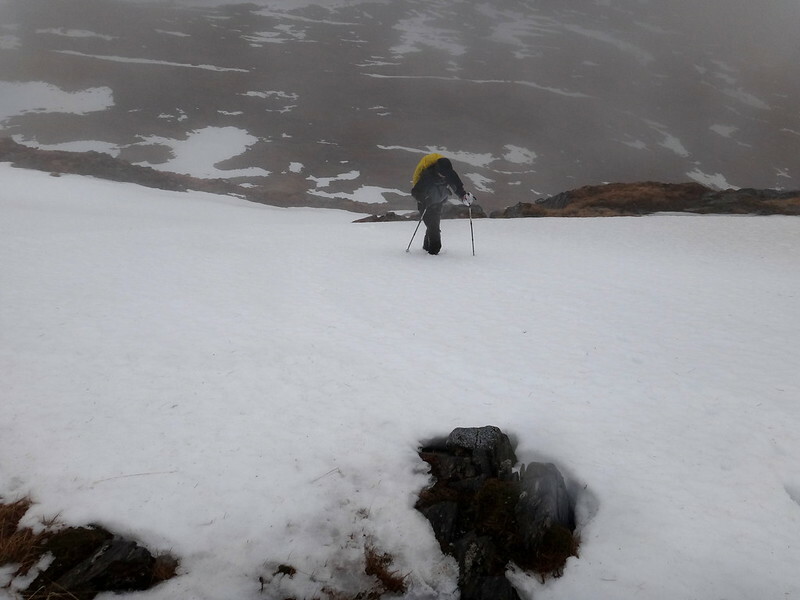 My shoes and my gloves were completely soaked by then and all the falling and stumbling over the last days had seriously damaged my waterproof trousers so that everything below my waist line was wet. Which led to the chafing (friction burn?) of the inner parts of my thighs which caused some pain. The decision was easy. The wind blew from the west, so going east meant less wind in the face. This route added another 5km to our way back, but at this point we were not aware of this. 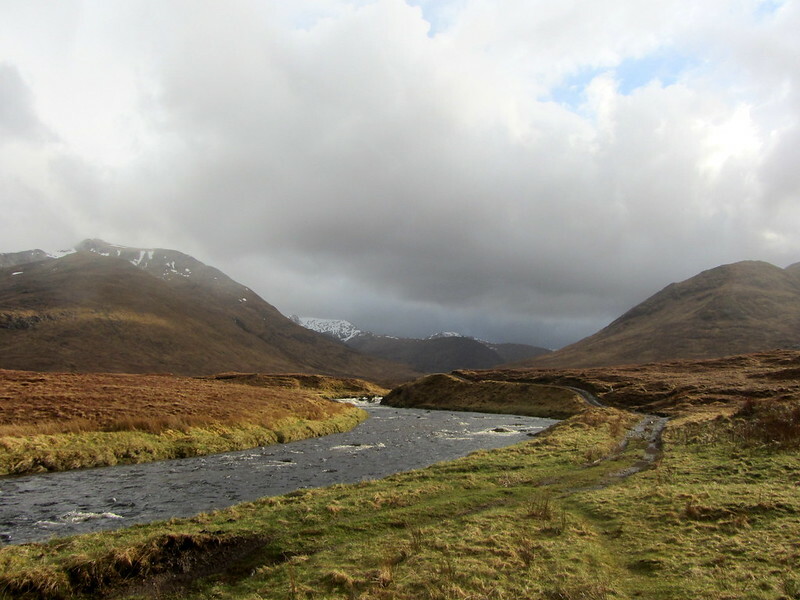 After a long descent through the narrow valley we finally arrived in River Affric and turned west. The final 8km very long, wet and painful. I had to walk like the incredible Hulk to avoid any more chafing. It must have been around 8pm when we finally arrived back at the tents. Our friends had a nice day at Loch a Bhealaich with similar (bad) weather although maybe not as harsh as it was on the ridge. Day 4, A chilling visit to Santa's hideout. After a good nights sleep we crawled out of the tents and had … no rain, even the sun through the clouds. 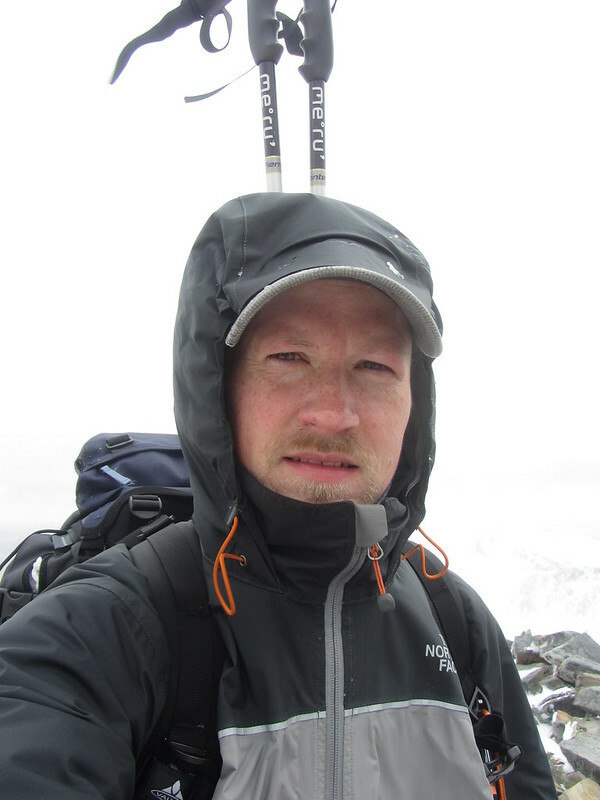 Over night we had rain but additionally the temperature must have dropped because above 600m there was snow. What a beautiful sight this was. All the surrounding mountains were white as if some giant confectioner had scattered sugar over the landscape. Breakfast had become a ritual by now: porridge, coffee, corned meef, whitebread with honey and some cheese. Where did that white stuff come from? Today’s route should take us back to the start at the Morvich campground. 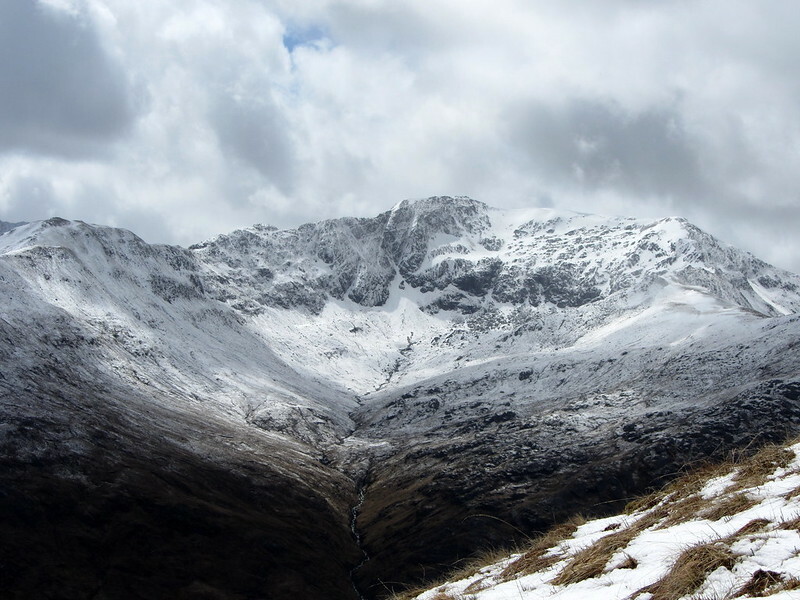 But as the day before our group of 7 separated and four of us planned to climb Bheinn Fhada while the others planned to walk via Glen Lichd and River Croe which involved no climbed at all. 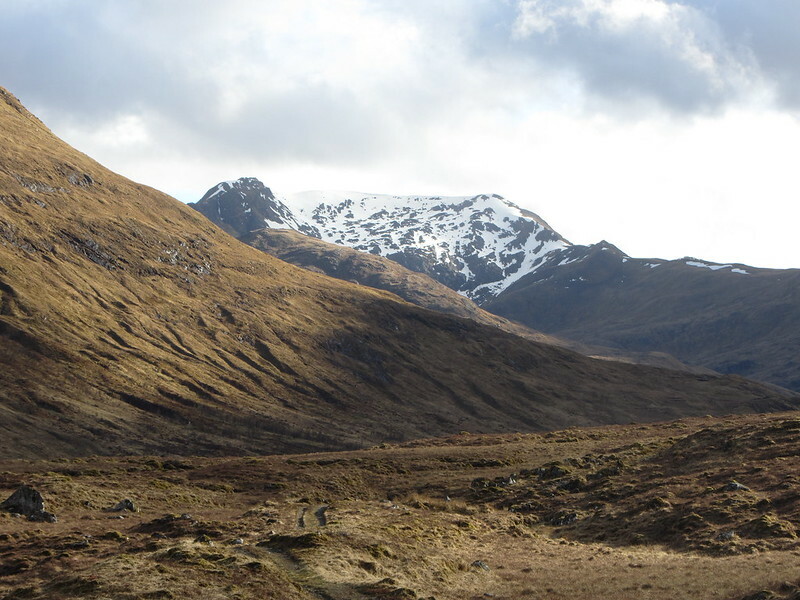 At ten we started with the strenuous ascent of Bheinn Fhada on a direct route close to the Camban bothy. 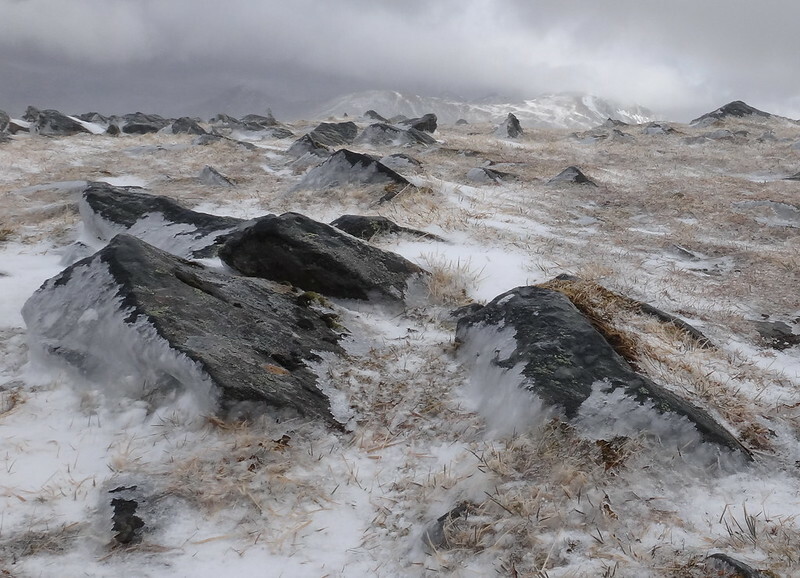 The snow above 600m was a bit of a nuisance and caused a few stumbles. Soon we had to put our waterproofs on because a light rain had set in. 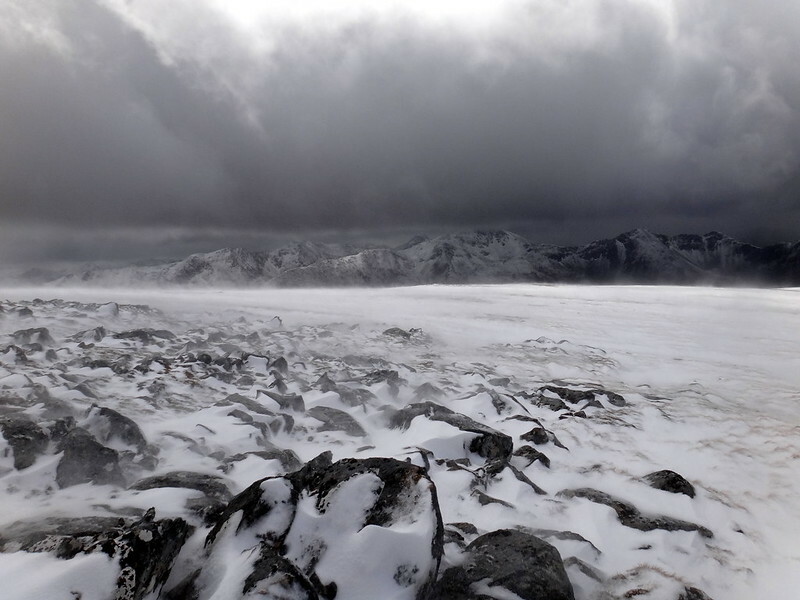 Above 700m the rain became snow and the wind grew stronger. When we arrived at the ridge below Sgurr a Dubh Doire we had a wonderful view of Glen Affric all the way to Loch Affric and also of the ridge that we had walked along yesterday. But not long after the wind increased again and brought clouds and hail with it. The view had disappeared altogether. Conditions up here were more serious than the day before. Snow was everywhere and it covered little recesses in which we sometimes stepped. Thus we tried to avoid any deep snow but soon found the difference between new (very soft) and old snow (hard, walking on it no problem). 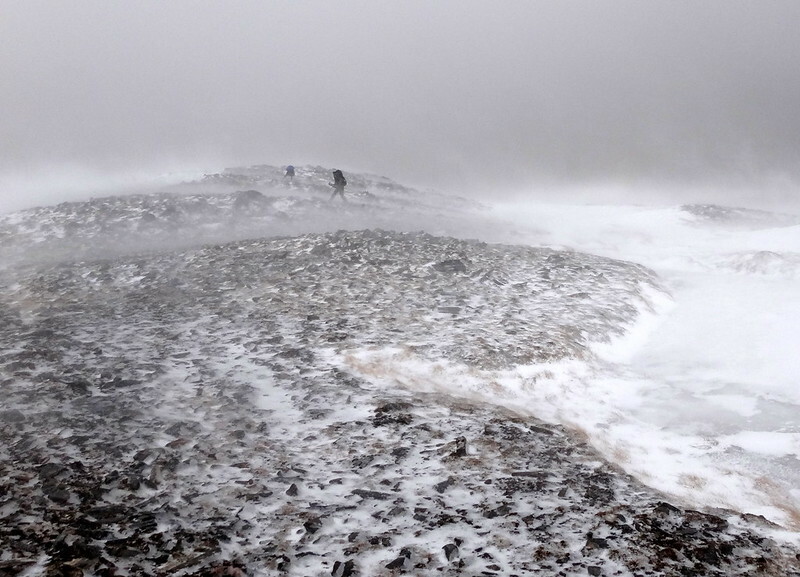 On the way to the cairn of Bhein Fhada which was still 2km away and could be seen from time to time the wind propelled the snow and ice into our faces. Very soon every inch of bare skin was freezing and stinging. I would have given a fortune for ski goggles. Finally we arrived at the cairn and had to gather our strength to have a mouthful of whisky before hurrying off this Munro. Actually I had the intention to find the geocache that is hidden up there but my mates would have left me behind (or worse) if I would have made the suggestion to do some geocaching. We then headed to the north west to find the path that descends leads back to Morvich. Where are my Ski goggles? This was found easily and 15 mins later we enjoyed the view of Sgurr a Choire Ghaibrh with its steep cliffs. At this point even the sun came out but this was only a short interlude and soon it was raining again. 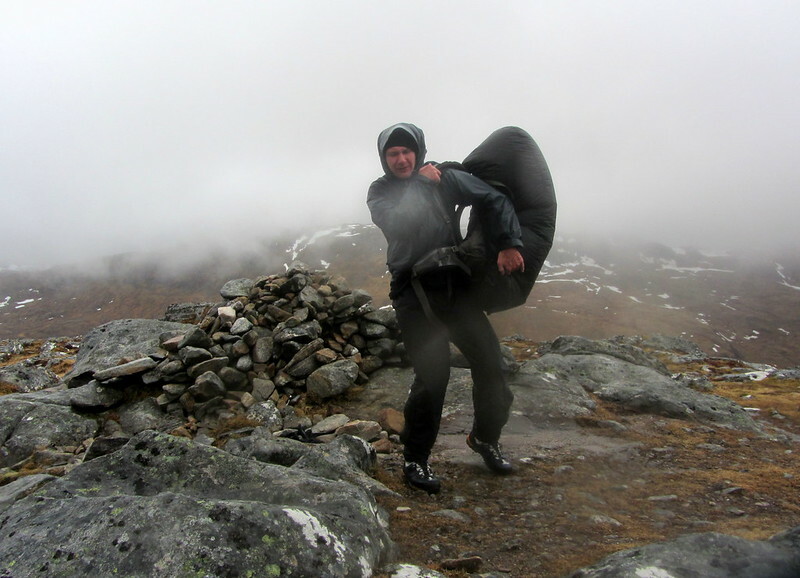 The remainder of the walk back to Morvich was wet and windy but otherwise uneventful. No more snow, just rain instead. We arrived at 4pm and met our friends at the campground and there we all gathered in the drying room because it was so wonderfully warm. Then we pitched the tents and had a decent and very long shower. When we finally looked like human beings again it was decided that we should have a fine beer and fish & chips if possible. 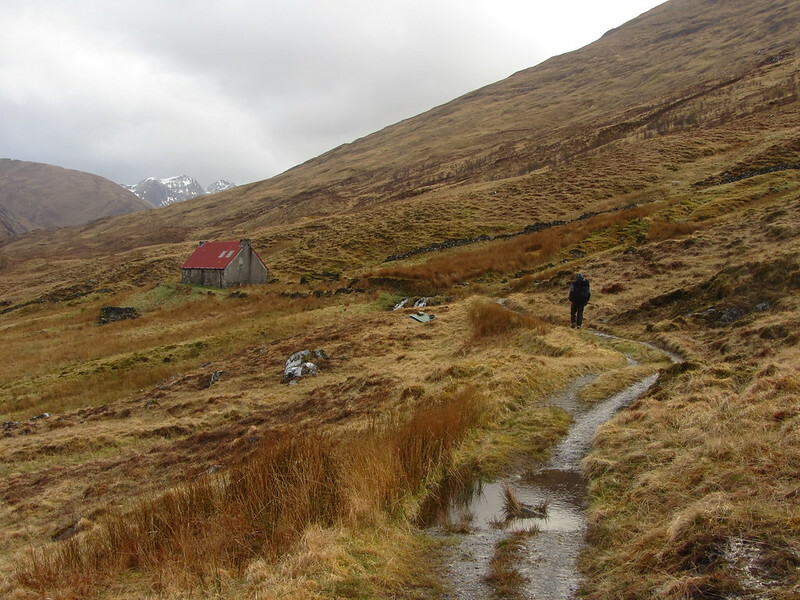 The pub of our choice was the Kintail Lodge just a few kilometers away. We entered and were surprised to find there a waitress who spoke german with a hint of a Berlin accent. As we had each a pint of red cuillin accompanied by haddock and chips we learned that she indeed came from Berlin and had migrated to Scotland. Back at the tents we had another beer in the drying room and went to bed. After waking up at 6.30pm we had breakfast and started at 8 the long drive back to Edinburgh. 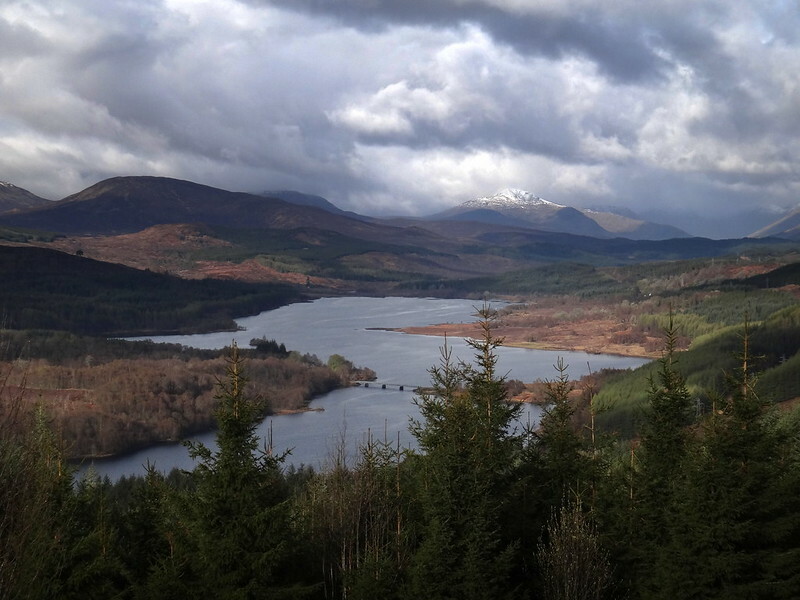 We had a quick stop at the view point above Loch Garry and another fuel stop in Dalwhinnie before we arrived in Edinburgh. On the flight back to Berlin we had finally some time to reflect on the last days and although the weather was pretty awful the time together in the Highlands was wonderful. And thus we will be back next year in May. I promise! By the way, this walk killed my camera. Apparently it was so wet, that the flash doesnt work anymore. Last edited by Mancunian on Sat May 25, 2013 7:41 pm, edited 2 times in total. Yeah, the bloody weather. Spring came very late over here in Germany as well. 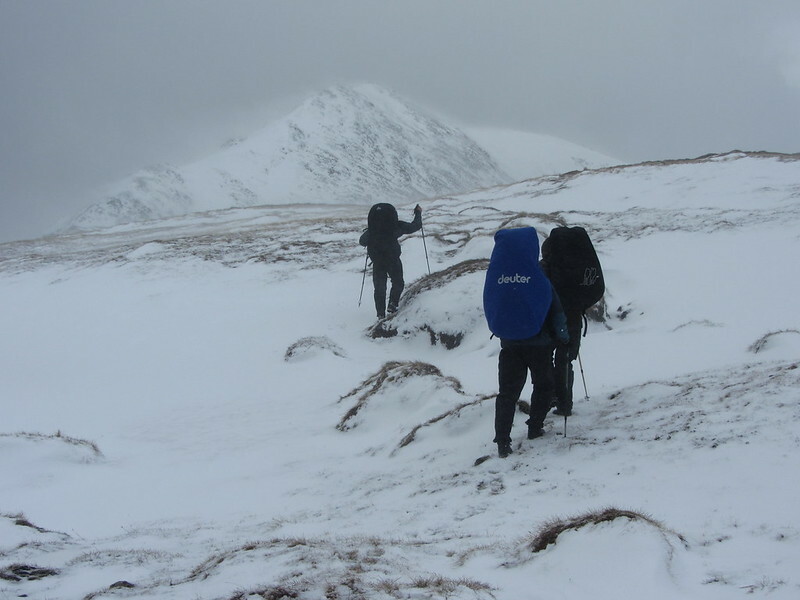 Last year around this time we were doing the Knoydart round in T-Shirts and mild conditions, but this year it was very different. But enjoyable nonetheless. And I would reckon that the harsh weather made the overall experience even more intense. Although having views would have been great too. Thanks skuk007. Oh yes, soggy it was. Especially my shoes, which was annoying. Two years ago I was wearing my Teva sandals when I flew back and carried my wet walking boots in a plastic bag. At the airport there was this very "friendly" lady from Ryanair who insisted that I put my wet boots on in oder to have only one piece of luggage. Otherwise they would charge my 30quid for the shoes as an extry piece of luggage. AAAARGH! What a 5 day trip amazing in those conditions,the weather sure has been crazy this year i hope you all get better weather when you come back next yeay all the best. quoman wrote: What a 5 day trip amazing in those conditions,the weather sure has been crazy this year i hope you all get better weather when you come back next yeay all the best. Great report and very interesting to read. I want to do with some friends a one week tour in the Kintail area in August. This will be our first visit to Scotland. I would like to know why you rent a car instead of going by public transport? Is renting a car cheaper? Is it a problem to leave the car on a car park or next to a road (parking fee, thieves, etc.)? Do you have any experience with public transport? Truly epic! I admire your tenacity and endurance as I would have sought lower levels - or the pub . I feel for the guy who was blown over and carried on - what a trooper I managed that [being blown over] twice trying to get up the West Monar hills in April and promptly gave in . Brilliant effort. fantastic report and you have my total respect! it's difficult when you only have a few days planned in advance. May is supposed to be the most reliable month but that is all relative! I'm looking forward to next year's epic! El_Catador wrote: Great report and very interesting to read. 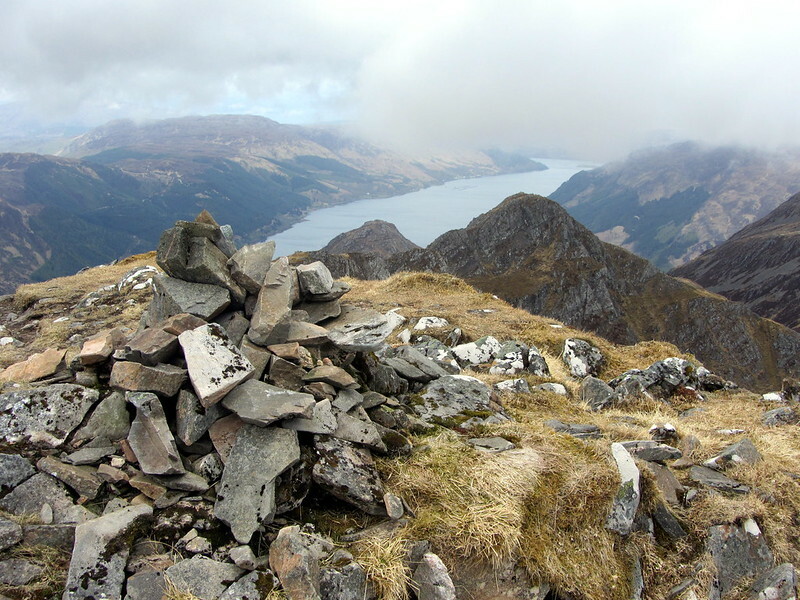 I want to do with some friends a one week tour in the Kintail area in August. This will be our first visit to Scotland. Last but not least: we are always 6-8 persons and hire 2 cars. I am not quite sure but I'd assume that hiring them for 5 days is actually cheaper than paying for public transport for all the persons. So i'd suggest to have a look at the hired car prices and compare them with the public transport charges. Take all the aformentioned points into account and make your own decision. NevJB wrote: Truly epic! I admire your tenacity and endurance as I would have sought lower levels - or the pub . I feel for the guy who was blown over and carried on - what a trooper I managed that [being blown over] twice trying to get up the West Monar hills in April and promptly gave in . Brilliant effort. Thanks NevJB. Yes, my mate was pretty devastated when he was blown over because he just didn't expect that. The wind was so gusty it was just totally unpredictable. But in the end he wasn't hurt and we just walked on. The whole walk seems so unreal now that I'm sitting here on the sofa reading all your comments. mrssanta wrote: fantastic report and you have my total respect! it's difficult when you only have a few days planned in advance. May is supposed to be the most reliable month but that is all relative! I'm looking forward to next year's epic! You're too kind. After all travelling a thousand kilometers to the hills makes us a bit more determined and we just have to cope with the weather. One way or the other. 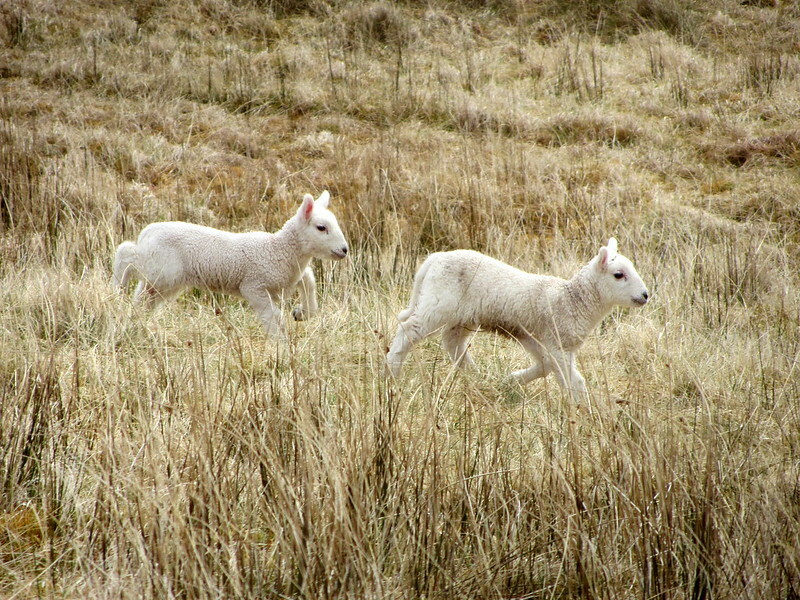 May is for us the month of our choice not only because of the weather but also because the midges are not as active then. And then Ascension Day is a public holiday in Germany so we only have to take 3 days off work. I'm looking forward to next year as well but if everything goes well I'll be in the Lakes next sunday. It's a shame about the weather because it makes or breaks a holiday. If only you had got some sunshine you would have had a fantastic adventure. That's Scotland for you I suppose, It's a beautiful country but the weather is VILE . I hope it's not too long before you're back on these shores, and hopefully the weather will be kinder then. morag1 wrote: That's Scotland for you I suppose, It's a beautiful country but the weather is VILE . That hits the nail on the head. After reading Dooterbangs recent TR and seeing the fantastic pictures it is more than obvious that Scotland in general is a beautiful country. The weather is apparently another issue. When we book the flights in January there is no forecast for May. So we just have to cope with whatever weather we get. This year it has been bad"vile" but last year it was very nice. 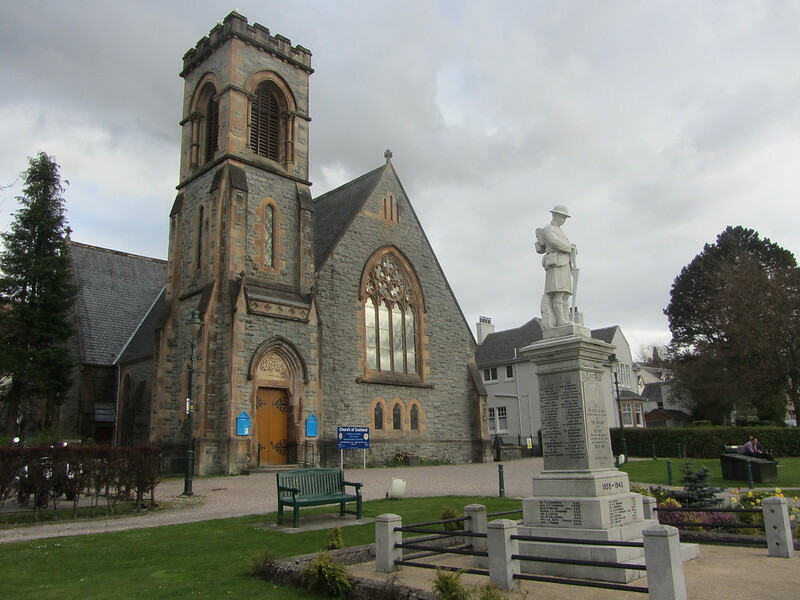 But to be honest the weather is part of the fascination of the highlands for me. Your camera woes continued this year, next year strap it to your chest. 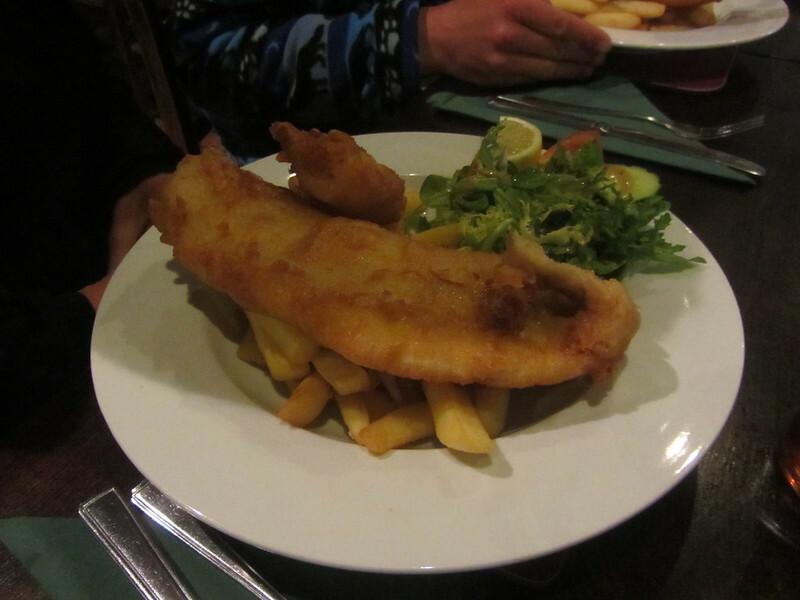 This area is another favourite of mine, the Kintail Lodge is a great pub with decent food.